‘[His] Fables are like a basket of strawberries. You begin by selecting the largest and best, but, little by little, you eat first one, then another, till at last the basket is empty’. So wrote the famed memorialist Madame de Sévigné (1626–1696) on Jean de La Fontaine’s Fables, produced in several volumes from 1668 to 1694. 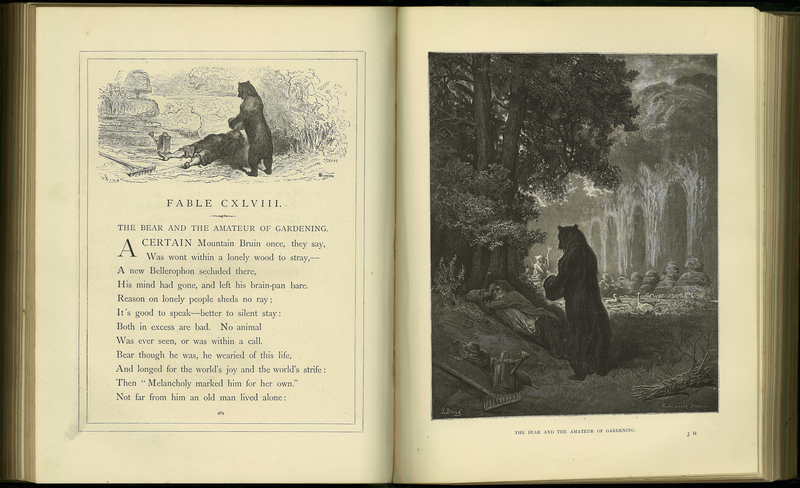 The 239 stories – many of them morality tales that highlight the foibles of human nature – derive from classical fabulists such as Aesop and Phaedrus, earlier French writers like Rabelais and Clément Marot, and from the East, like this one: ‘The Bear and the Gardener’ (L’ours et l’amateur des jardins), a tale warning against making foolish friendships. La Fontaine’s work is a classic and requires little enhancement. However, in 1868, Gustave Doré (1832-1883), the French artist, produced his timeless illustrations for the text. This is a late 19th century English language reprint. Jean de La Fontaine, “Fables,” ourheritage.ac.nz | OUR Heritage, accessed April 26, 2019, http://ourheritage.ac.nz/items/show/10565.